Before leaving California, we got a chance to really meet someone I had previously only "met" online. He happened to email me, wondering if we would be in Los Angeles during our sojourn home. I told him we were considering it, since we were thinking of swinging by Disneyland. His response, "Well, if you go to Disney, I'll sign you in." I didn't know that Ray works for Pixar, and so can sign anyone into Disney he likes. (And, he likes us! He really likes us!) Actually, it was his lovely wife, Kathy, who did the signing in (picking us up at our RV park, no less). 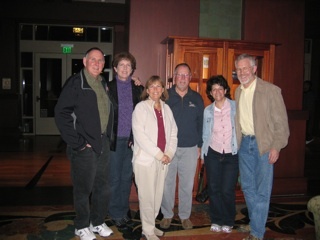 Then, we all met for dinner afterwards with another fabulous POGy couple. That's Kathy and Ray Davis, Janet and Ken Zittrer, and of course, me and Tim. I've "met" so many wonderful people online since QUEEN OF THE ROAD came out, and I cherish all those relationships. But, after getting signed into Disney, I must ask the rest of you, "Nu? What have you done for me lately?" 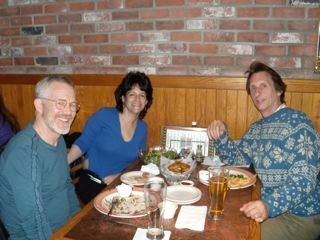 For any who have read the book, we also had dinner in Redondo Beach with John Rainey, screenwriter and screenplay critiquer extraordinaire. We met him at his bachelor pad first, so got to see "Rainy Central" - where all that screenwriting magic, as well as the crushing of dreams (of certain clients, never yours truly - I hope) occurs. He lives across the way from one of the stars of that surfing reality show that took place on Hawaii a few years back. (It only lasted one season and the name escapes me - anyone know?) When John mentioned that, he was rather surprised I had seen it. Oh, John. How little you do know me. well, you might have said "...where the cultivating and refinement of screenwriters' dreams happens, unless the writing is so inadequate that the writer needs to be encouraged to seek another path to fame, fortune, and enlightenment, like bolt tightening, or TV repair, or something that doesn't require complete sentences to execute." But then, the above sentence alone would scare any ADD writer from ever seeking out my services... or maybe not, because s/he would never conjure the attention span to complete it. omg! have I exposed my true critical colors? Am I getting charged for this rewrite? My hubby and I went to Disneyland in the days before children. We drove down from San Francisco where my dad was living at the time. We were like two kids ourselves, enjoying the rides and sights. Heh... my baby girl just finished her first semester of Animation at Sheridan College with a 4.93 average. Maybe your new buddy Ray can put in a good word for her at Disney! Not if I don't have to own up to that "There's Something About Mary" 'do' that I'm displaying. Did you loan me some hair gel? This page contains a single entry from the blog posted on February 5, 2009 10:40 AM. The previous post in this blog was Pimp My Walker!. The next post in this blog is The Short Way Home.